Everyone has a bit of Brahma, Vishnu & Shiva in oneself; the difference lies only in the proportion of each! Okay I am a creator alright and a preserver too; my husband is an amalgam of all three. Yeah, I don't have the heart to destroy or cast aside my still-as-new possessions. But during spring cleaning sessions, I let my better half take the reins and turn a blind eye so that some clutter would be given a fitting farewell. Still we are proud of our family collections that are preserved in our 'home-museum'. We have preserved collectibles through the years - I know you have read my earlier posts on them. But what I'm going to speak about now is different - it's about family 'creations' preserved over the years. My family gets excited during every visit as I dig up some interesting souvenirs connected with their growing-up years. They love to show off to their little ones - how it was "When Daddy was little". 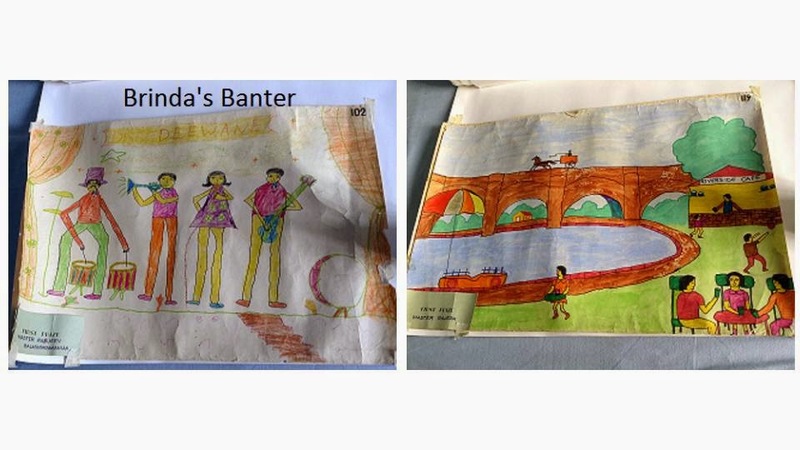 That's not all - there are similar stuff from my school days still used by me. I have to thank my mom for those as she had included them in my wedding 'luggage'! I can say I have her genes! I got to organize all of these treasures together recently when there was complete re-hauling of the various storage spaces during the recent house painting session. 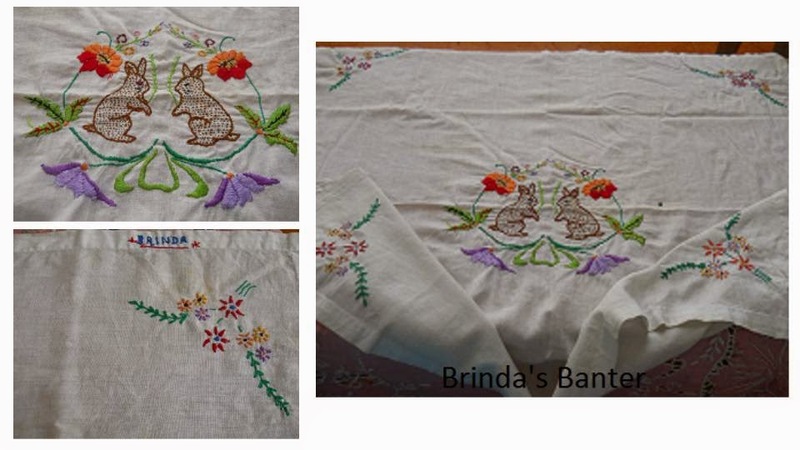 Take for example this beautifully embroidered table cloth - my name embroidered in one corner. 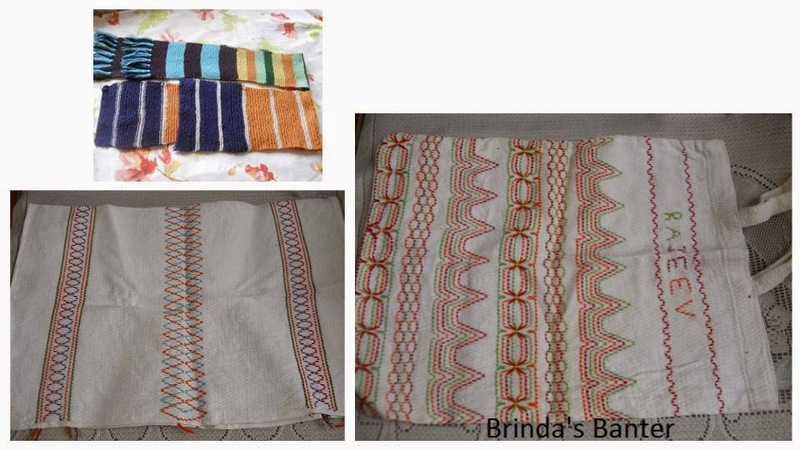 This was what I had made for 'Needle-work' class in my ninth grade and it is still in use. After the mother's handiwork, wouldn't you like to take a look at my kids' creations for 'Needle work' class in sixth / seventh grade? Don't look surprised - even the boys had to use the needle creatively! Here is their embroidery work. And look at the scarf each of them knitted in school. Believe me, their Dad uses them for his early morning walks in winter! Well created and well preserved and well utilized! Sorry I don't have the sweater and socks I had knitted in school! Too bad. But the sweaters I knitted for the entire family after my marriage have been put to good use. One of the sweaters I had made for my elder son (when he was five) has been gifted to his daughter and the one knitted for my younger son has been worn by his son. My mom had preserved and handed over my lovely green frock-sweater knitted by her (with all the fancy buttons intact) during one of her visits. She knew I couldn't put it to use as I didn't have a daughter. Neither did my sister. Mom expected me to give it to the next generation kids in course of time. But I'm ashamed to admit I lost it - I mean I didn't realize when my husband had discarded it! Next let's look at the art work section. 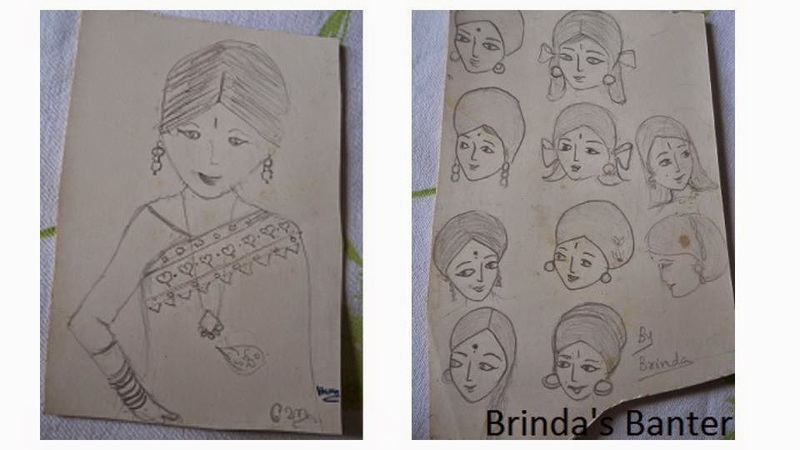 As a teenager, I loved to draw faces - that too of ladies. My kid sister wouldn't want to be left behind - sometimes she did come up with awesome creations. Look at the sisters' art works. Don't ask me how I have these 50 year-old gems! It would be no surprise to hear that we have preserved the drawings and paintings of our boys - even the ones which bagged first prizes for them in their respective group at the annual painting competition for children in CME, Pune. Even the connoisseurs ourselves don't remember how we had got hold of them - in all probability, the award -winning entries had been displayed and forgotten and we'd have laid our hands on our children's creations! A couple of years ago, when our grand daughter made cute cards for us, we could not but notice her dad's genes in her. We were absolutely delighted to see an uncanny resemblance to ourselves in the first one. The second card was a drawing of all our four grandchildren - she seemed to have inherited the family's aesthetic sense. 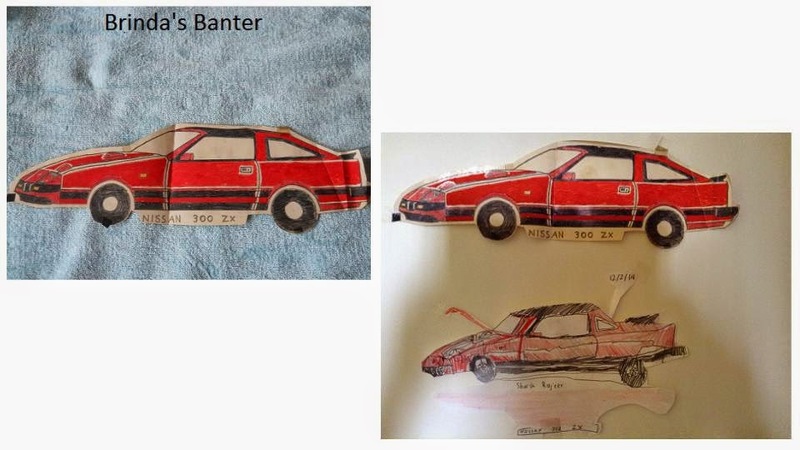 Recently when my grandson was around, I showed him the Nissan his dad had drawn. His instant reaction was 'WOW!' He then asked for a paper and in the next ten minutes finished drawing his version of the Nissan - with the bonnet open! So now I have this father-son creations too. Next, our literary works. I have a whole file of newspaper 'Middle's as well as articles published through the years - most of them by yours truly and some by my sons. 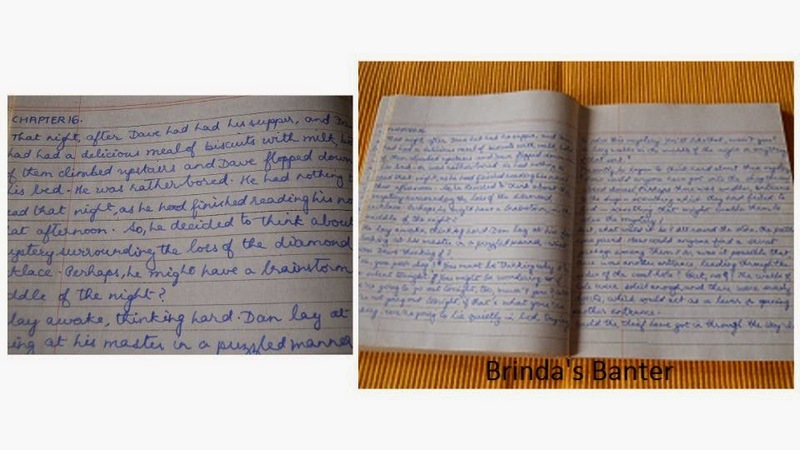 What takes the cake is the detective novel written in Malayalam by my husband at 13 - it was published and won acclaim. 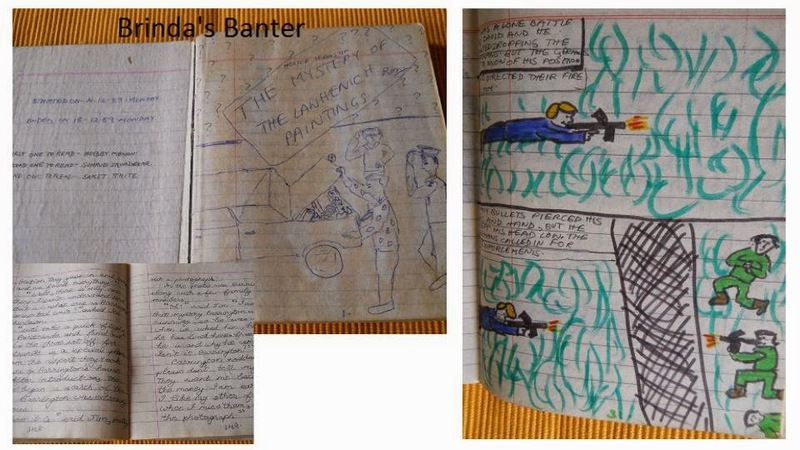 My sons proved to be chips off the old block(s) - we have the manuscripts of the novels they had written as school boys but unfortunately their parents were not enterprising enough to get them published! Our sons and their better halves now would roll with laughter reading the stories together and enjoying the illustrations. Just waiting for the kids to grow a bit more to enjoy reading them. What is really admirable is that there are barely any cuts or corrections in any of the pages - and mind you it is the first and only copy! Next take a look at our film songs diaries. 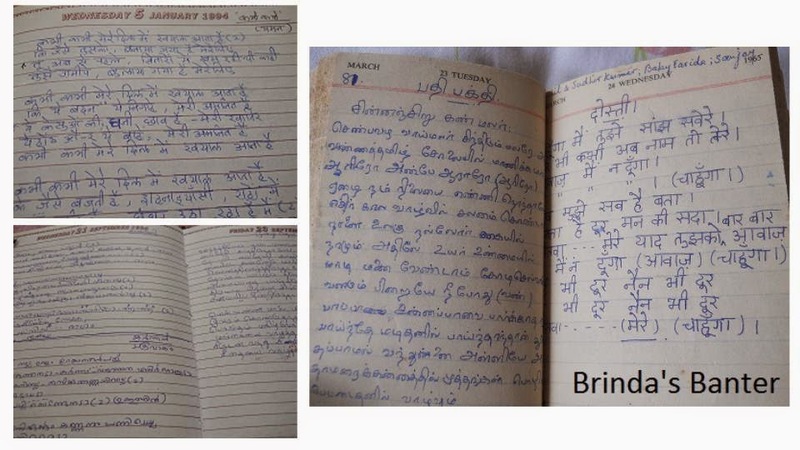 I started writing down the lyrics of Hindi, Malayalam and Tamil film songs as early as 1965 (see the diary year). I'd borrow film-song books from my friends and dutifully copy them in my diary - no dears, there was no xerox facilities those days! After marriage, both of us have been adding to the collection and we now have five diaries. The Hindi songs are penned in Hindi script. As for the other two languages, the same song would be written in Malayalam by hubby and in Tamil script by me (we have an unending dispute about our mother tongue - he says his is Malayalam and I say it is Tamil, though both of us speak the same dialect - Palakkad Tamil). I have preserved my modest collection of 'paattu pustakam' (song books) sold at the theatres during the screening of movies for 50 paise. The interesting part is the song book of 'Arzoo' (Hindi movie) is in Malayalam and that of 'Aradhana' is in Tamil. Most of the Tamil movie song books I have are also in Malayalam. 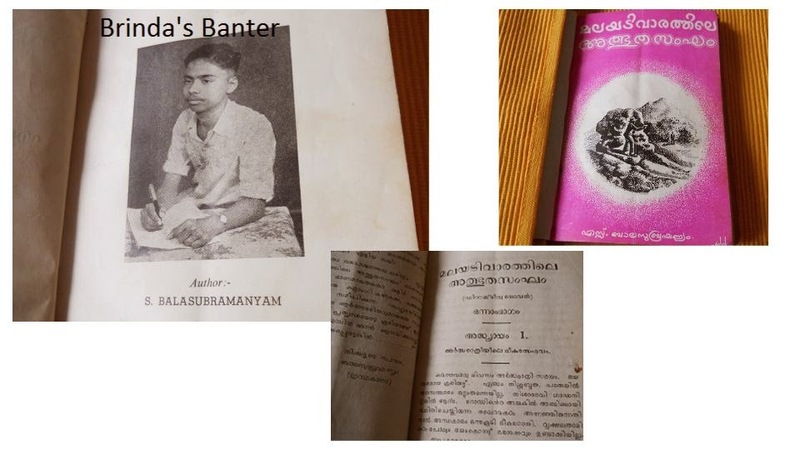 So you can guess that I had spent most of my teenage years in Kerala. There are more interesting collections lovingly tucked away as heirloom - like the albums of my sons'stamp collection. My husband deserves kudos for neatly preserving the Progress Reports of each grade of each of our sons. More for being able to retrieve any of these collections at the snap of a finger!